South Korean retail giant Lotte Group’s home shopping operator Lotte Home Shopping unveiled on Friday its plans to step up as a world-leading media commerce company by 2025. According to Lotte Home Shopping, it will strengthen its business fundamentals by developing its mobile shopping platform and will offer consumers an advanced shopping experience by introducing VR and AR technology. The company said it will strive for dominance in the domestic home shopping industry and hopes to be the No. 1 media commerce company by 2024. By 2025, its goal is to lead the market globally. Based on the four pillars of its company values, which include creativity and professionalism, Lotte Home Shopping said it will diversify its private brand lineups and strengthen its online and mobile shopping services. It will strive to differentiate the content on its T-commerce channel, the company added. “The home shopping industry in Korea is experiencing (ongoing changes in the) shopping environment and customer preferences. 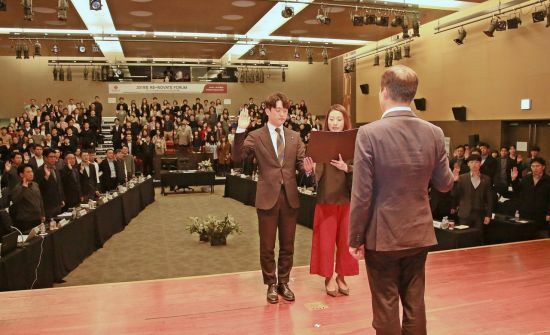 It is time for us to pursue innovation to go beyond (our current level of success) as a home shopping company,” said Lotte Home Shopping CEO Lee Wan-shin during a ceremony in Seoul.